The 2007 Pro Bowl was the National Football League's all-star game for the 2006 season. The game took place on February 10, 2007, at Aloha Stadium in Honolulu, Hawaii. The game was held on a Saturday instead of the usual Sunday after the Super Bowl because of a request by broadcaster CBS. 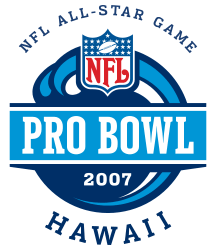 The 2007 Pro Bowl marked the 28th consecutive time that the National Football League's all-star game is held in Honolulu. The NFC was coached by Sean Payton of the New Orleans Saints. The AFC was coached by Bill Belichick of the New England Patriots. AFC quarterback Carson Palmer was selected as the Most Valuable Player of the game. This Pro Bowl is mainly remembered for Sean Taylor's big hit on Buffalo Bills punter Brian Moorman. AFC quarterback Vince Young scrambles past Antonio Pierce for a first down during the third quarter. NFC – Tiki Barber 1-yard run (Robbie Gould kick), 12:24. NFC 7–0. Drive: 9 plays, 67 yards, 10:40. AFC – Reggie Wayne 72-yard pass from Carson Palmer (Nate Kaeding kick), 11:19. Tied 7–7. Drive: 4 plays, 74 yards, 1:05. AFC – Adalius Thomas 70-yard fumble return (Nate Kaeding kick), 7:42. AFC 14–7. NFC – Frank Gore 1-yard run (Gould kick), 4:09. Tied 14–14. Drive: 7 plays, 53 yards, 3:33. AFC – LaDainian Tomlinson 3-yard run (Nate Kaeding kick), 9:36. AFC 21–14. Drive: 9 plays, 57 yards, 5:19. AFC – Chad Johnson 42-yard pass from Palmer (Nate Kaeding kick), 12:47. AFC 28–14. Drive: 3 plays, 71 yards, 1:24. NFC – Steven Jackson 4-yard run (Failed 2 pt. conversion pass from Tony Romo), 2:52. AFC 28–20. Drive: 4 plays, 11 yards, 1:25. NFC – Anquan Boldin 47-yard pass from Tony Romo (S. Smith 2 pt. conversion pass from Tony Romo), 1:48. Tied 28–28. Drive: 4 plays, 58 yards, 1:04. AFC – Nate Kaeding 21-yard FG, 0:00. AFC 31–28. Drive: 7 plays, 63 yards, 1:48. ↑ Reardon, Dave (2006-03-10). "Pro Bowl's move to Saturday fine with HTA". Honolulu Star-Bulletin. Retrieved 2007-02-10. ↑ Beacham, Greg (2007-02-09). "Vince Young Not on Vacation at Pro Bowl". The Washington Post. Retrieved 2007-06-19. "Palmer leads AFC to Pro Bowl win over NFC". NFL.com wire reports. 2007-02-10. Retrieved 2007-02-11. "NFL Gamebook – 2007 Pro Bowl" (PDF). NFL.com. 2007-02-10. Retrieved 2007-02-11. Wikimedia Commons has media related to 2007 Pro Bowl.